While Nintendo has been increasing their presence at consumer events in Japan - including Kyoto’s Bitsummit indie game show as part of their ”Hello Indie World” campaign - the company has never had an official showing at Japan’s flagship gaming event, the Tokyo Game Show. In 2018, things appear to be changing; not only was Nintendo a sponsor of the event, it also found itself front and centre at the Japan Game Awards, presented on Thursday night. The ceremony kicked off with an award for the Nintendo Switch itself, receiving the Ministry of Economy, Trade and Industry (METI) award. Producer of both the console and Super Mario Odyssey Yoshiaki Koizumi accepted the award, accompanied by a sizzle reel of the system's variety of software. The reason for the award was “Freedom to have fun. Wherever. Whenever.” Nintendo Switch arrived on the scene as new game hardware catering to today’s diversifying lifestyles. It united the demographic which uses it as a console for play as a family with the demographic which uses one screen per person as a portable device and became a one-fits-all game hardware never seen before that suits any style of play. Nintendo’s titles developed from this radical console are extremely polished and original and continue to propose new forms of play. This has prompted much activity in household game development and spurred momentum for new software. Such integration of hardware and software has gained the strong support of users in Japan and overseas, with units selling very quickly and causing a worldwide movement, even bringing household game consoles back into focus. All were in agreement to select the Nintendo Switch development team for creating such wonderful game hardware, recognizing their stance in relentless pursuit of the potential of gaming and their astonishing accomplishment. The Legend of Zelda: Breath Of The Wild was next to pick up a prize, taking the Game of the Year Global Award, collected by producer Eiji Aonuma and director Hidemaro Fujibayashi, with Call of Duty WWII taking the overseas equivalent. The Legend of Zelda: Breath of the Wild, the winner of the Japan Game Awards 2017 Games of the Year Grand Award, has won this year’s Global Award for Japanese Product. This award is awarded to the most highly rated Japanese title in the overseas market. Users in Japan, regardless of gender or age, showed overwhelming support and praised its high quality as “the masterpiece of the series” and “certainly deserves the Grand Award” in its win of the Grand Award. The great support it earned in overseas markets as well were considered. Next up was the best sales award, won by (Switch bound) Dragon Quest XI. Super Smash Brothers Ultimate director Masahiro Sakurai then took to the stage to present the Game Designers award, which went to the gorgeously-illustrated puzzle game Gorogoa. The Game Designers Award recipient is selected with the utmost emphasis on originality. However, if a title has not become known, it would not be voted for. Gorogoa is a puzzle game in which users progress by moving layers of images, laying them side by side or on top of each other. That description, by itself, may make it seem like a game commonly available, but the splendid art, the unexpected solution, the mysterious story progression and presentation without the use of any text—this software is filled with virtues unique to itself. I don’t think too many people have played Gorogoa. However, many of the judges had played it and awarded it many votes, making it the winner this year for both the number of votes awarded and the number of fans on the panel of judges. For sure, this title is unlike any other. After the announcement, Sakurai himself played and commentated on the game live, commenting on the game's uniqueness and innovation. Developer Jason Roberts was sadly unable to attend, but a heartfelt message of appreciation was shown to the audience. The ceremony concluded with 11 awards for excellence, four of which were Nintendo franchises. 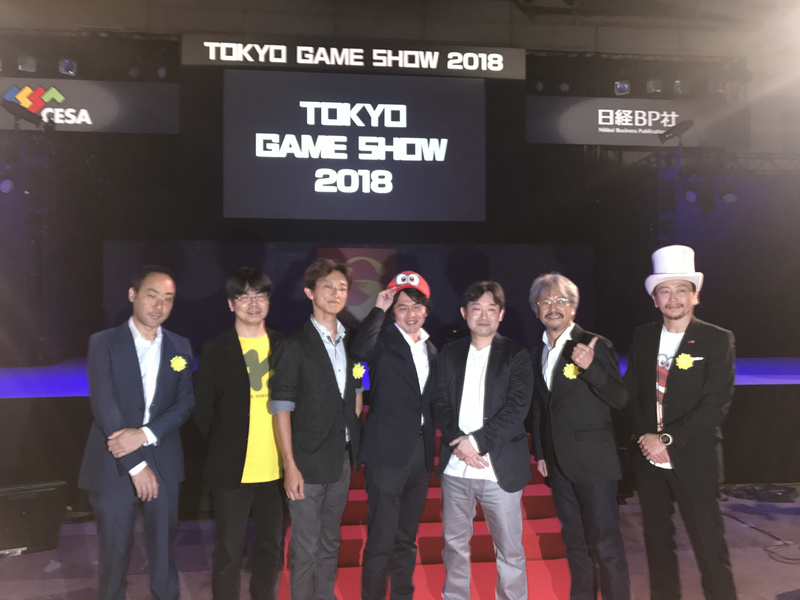 Koizumi explained how the team's heart and thoughts went into making Super Mario Odyssey and admitted the challenges faced, but also how everyone had a lot of laughs and fun producing the game. Splatoon 2, Xenoblade Chronicles 2, and 3DS title Pokemon Ultra Sun/ Moon were also winners. Director Shigeru Ohmori of Game Freak elaborated on how challenging the hardware of the 3DS was central to the development of the game, and how the series has been embraced by a wide demographic. Delightworks’ online roleplaying game Fate/ Grand Order, Call Of Duty World War II, mega-hits Fortnite, PlayerUnknown Battlegrounds, Dragon Quest XI and recent Switch release Undertale were also amongst the winners, with developer Toby Fox stating that he was repaying the debt he owed to Japanese games such as Chrono Trigger, which were so influential to the game. Finally, the overall winner of the category was Monster Hunter World, with the development team expressing their gratitude that the game has been embraced across the globe, their desire to reward players and their intention to carry on the series long term. What were all the yellow flowers about? Call of Duty WWII... Really? There's games 10 times better than that in the west. @gcunit I thought it might be to do with the recent earthquakes and it's victims but that's purely a guess. @mgnoodle is that why Monster Hunter World, a game NOT on Nintendo won the top prize for games? How is Zelda BOTW still winning awards? It's a year and a half old. ARMS didn't win any award. @Anti-Matter Honestly, as much as I like the gameplay of ARMS, it isn't a game that could ever win any award. In terms of gameplay, character design, stage design, graphics and music, the game is great. But there is no glue to hold all of this together. We rarely get to see the world of ARMS outside of the battles, which is something I hope gets improved in ARMS 2, if they ever make one. Japan Game Awards have been running in some form since 1996. What Nintendo sponsored was the Tokyo Game Show event itself (which is a massive event) because they themselves were present for the first time. It's basically Japan's Gamescom. It just also plays host to the award show. @Arcade91 Agreed. Part of what makes Splatoon special is that it does exactly that - show you the world outside, and give you a connection to it. Arms is just like "heyo, pick a fighter an go", and while it is fun and honestly pretty innovative, you just don't get attached to the game universe. There's nothing to relate to really. @mgnoodle Well Monster Hunter world was "overall winner"
NL just put it at the very end. @Razer I think that prize was for having to give one to a token western game. That's the only one they've heard of other than Minecraft. Well, the biggest awards went to Nintendo and Capcom, which are headquartered in Kyoto and Osaka, respectively. If anyone in Tokyo were playing favors, awards might've gone to the likes of Sony or BandaiNamco. why you can't post a list of the winners? Sony is b league comparatively.